Among the last batch of John Sayers’ wonderful donation of ocean liner ephemera is an intriguing file of Pinbacks and Mirrors. Here John contextualises one of the mirrors. This image is a relatively common Second War postcard view of the RMS Queen Mary, the famous passenger ship known as the ‘Grey Ghost’ for her speed and elusiveness while trooping. But this image is the front side of a purse mirror. Why is it on a purse mirror? 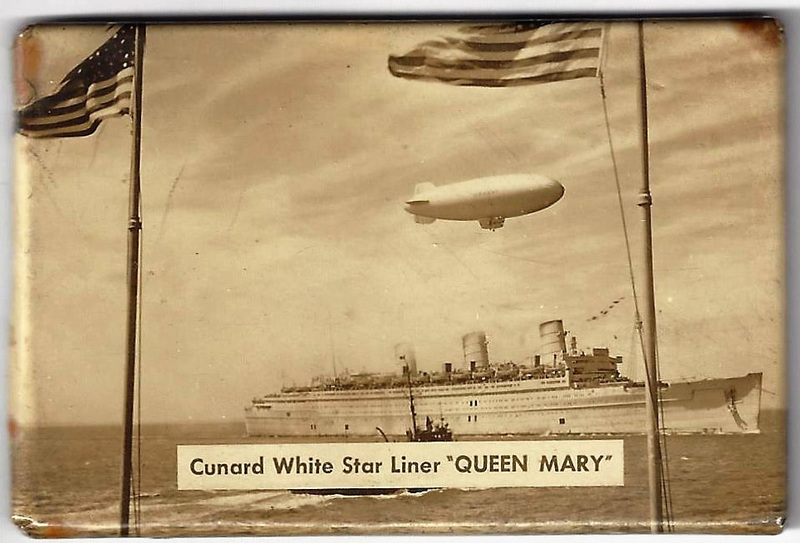 At the end of the Second War, the Queen Mary and her Cunard running mates, Queen Elizabeth and Aquitania, began to unwind the wartime carrying process by bringing troops back from Europe to America and Canada. After the First War, one of the popular gifts for soldiers to bring home to a loved one was a handkerchief printed with the caption “The Ship That Brought Me Home” and an illustration of the liner on which they travelled. Several examples are included in the Sayers Collection. For the Second War, it appears that a favourite gift may have been a mirror with an image of the ship which carried the soldier home. But there was also another possible element in this postwar story – War Brides. In the immediate post-Second War period, all three of these ships brought women who had married American and Canadian soldiers while they were stationed in Europe. There were thousands of War Brides, and all the menus saved by a War Bride on July 4, 1946 on board the Queen Mary are elsewhere in the Sayers Collection. The highlight which ties that day together is a printed message from the captain welcoming the passengers to “…the country of your adoption”. So, it may also be that these mirrors were purchased from the respective onboard Gift Shops on the Queen Mary, Queen Elizabeth, and Aquitania by some of the War Brides. It would be a logical purchase – feminine, useful, easy to pack or put in a purse, and relatively inexpensive for limited budgets. And it would capture for their memory the image of the ship on which they travelled, still in its wartime livery before being restored to the normal Cunard colours for regular passenger service. Ephemera can kindle not only our own memories, but also an insight to the lives of others. This material, and a vast quantity of other ephemera capturing social, shipping, historical, and commercial information in The Sayers Collection, continues to migrate across the Atlantic to the John Johnson Collection at the Bodleian Library.